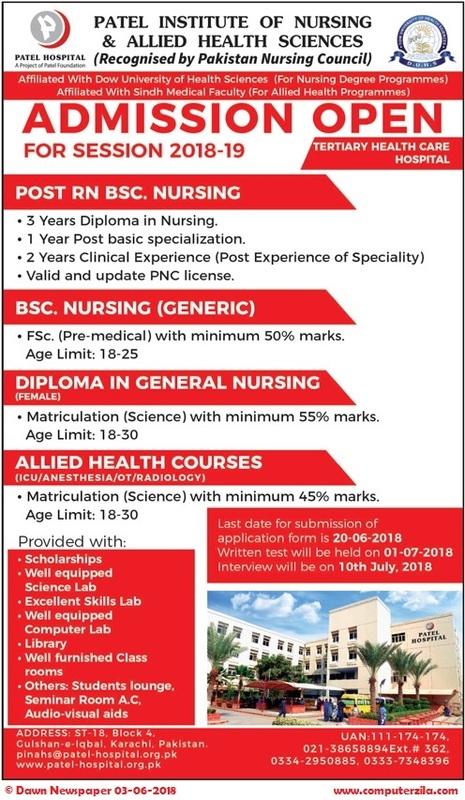 Admissions Open at Patel Institute of Nursing & Allied Health Sciences's Karachi Campus for the batch Fall 2018. PINAHS offers admissions in different fields of study for Diploma. you can apply for B.Sc. - Bachelor of Science, , . 1 Year post basic specialization. Valid and Update PNC License. F.Sc (Pre-Medical) with minimum 50% marks. University Address ST-18, Block-4, Gulshan-e-Iqbal, Karachi, Pakistan.